I'm a little too old to be a digital native, but I definitely have a strong preference for electronic formats. Why, then, have I spent a crudload of time and money on a personal library devoted to dead trees? Well, to start, my collection goes back decades, long before anything was digitized. Certainly, the vast majority of the Marvel and DC comics in my collection pre-date the world wide web. 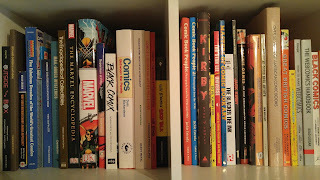 I could replace many of them with digital versions now, but my thinking is: why buy the same stories multiple times? If I want to read Fantastic Four #321, I can just pull out the copy I received as part of my subscription to that title so many years ago. The same thinking holds true for books I've gotten more recently, but were not ones I actually purchased. 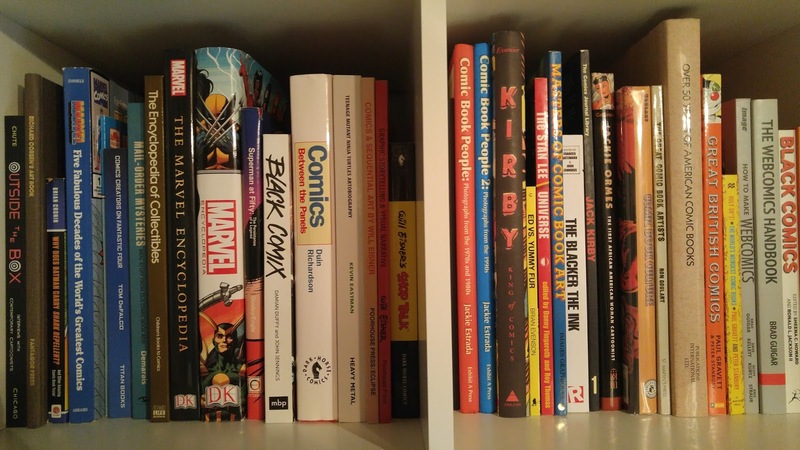 My father gave most of his collection to me several years ago, I literally found another 17 long boxes on a curb, and I've received a number of books as review copies and/or prizes. While I still didn't spend any money on these books, purchasing a digital copy still makes no sense to me because, again, I've already got a copy to read. My tastes in the past few years, roughly coinciding with the rise of comiXology, has veered towards independent comics. Not just something like you might get from Oni or Papercutz or another smaller publisher, but the really independent stuff, where somebody is trying to publish a book themselves. Maybe they're even running them off as small print jobs at a local copy shop, and stapling them themselves. I've seen and picked up a few books where the creator even silk-screened or hand-cut the covers individually! And those books -- the ones with insanely small print runs and are individually crafted -- tend not to get digitized at all. Typically, the creators working on them favor the artifact of the comic as much as the story, so they don't feel compelled to "bastardize" the experience by making it available digitally. So the only way to get a hold of it is to buy the dead tree version. Even books with larger print runs are often left off the digitization train. Maybe the creator doesn't feel an electronic version is "valid;" or they think there's more money to be had in print; or their test run of print books sold so poorly, they've got no inclination to try another format. I have one book that I purchased directly from the author, about ten years after its initial publication and it's hand-numbered as #433/750. It would seem he over-estimated demand by about half, and probably doesn't have a huge interest in rehashing things for an audience he's probably pretty well tapped already. Ultimately, all this boils down to: much of what I purchase is not likely to get much attention (either as second printings or digital versions) after the initial publication, so if it's something I'm interested in, I have to buy the dead tree version and physically store it. I don't mind -- this is how I grew up reading, after all -- but it does, at times, seem like an odd discrepancy for as much as I write and talk about digital and webcomics.